Vea la ciudad de noche en este fantástico recorrido por Dubai que incluye la entrada al edificio más alto del mundo. Viaja con tu guía experto a través de algunas de las principales atracciones de la ciudad, haz paradas en las fotos de los principales monumentos y aprende sobre la cultura y las tradiciones de esta popular ciudad de los EAU. 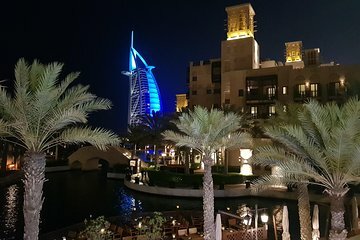 Echa un vistazo a los coloridos rascacielos de Marina mientras contemplas el horizonte de la ciudad y detente en Burj Al Arab y Atlantis como parte de este recorrido nocturno. Ver la ciudad por la noche con un guía profesional. Transporte hotelero ida y vuelta incluido. Este tour se realiza todos los días y toma reservas individuales, por lo que es ideal para aquellos que tienen poco tiempo o solo para explorar. Excellente soirée, magique avec la féérie des lumières, l'ambiance de la foule, la diversité des visiteurs.Surprise par la propreté de la ville, la gentillesse des habitants de Dubaï, leur amabilité.Ville fiable où il fait bon se divertir, rien ne manque. Je reviendrai.Guide vraiment investi et super sympa. Un vrai bonheur. What a great night out in Dubai City! I was the only attendee so my guide Mounir took me to many photographic sites to see the iconic buildings and the stunning skyline all so well lit up. The ride to the 124th floor of Burj Khalifa was so smooth, you didn't realise you were moving upwards so quickly. View from the top was amazing and afterwards we waited for the fountains to perform. Very worthwhile tour, I highly recommend it, especially for those interested in photography! The tour was amazing and our guide a wealth of information. Hat mir sehr gut gefallen, alles in Ruhe anschauen können, ohne Zeitdruck. An absolutely amazing tour seeing Dubai by night. Munir, my guide was very knowledgeable and friendly. An excellent guide so if you are lucky enough to get him, you will be in good hands. My only reason for giving 4 stars is because the website info said bottled water and light refreshments would be available, unfortunately they werent. However, a very enjoyable tour overall and would definitely recommend. Mr.Muniera was very friendly and safty driver.He took any pics for me. He knows very well about dubai beautiful spot. especially he took to me to the burj khalifa smoothly. Very good tour and I'm extremely happy with tour guide Sied - knowledgeable briefings, very polite, good conversationalist. Highly recommended - ask for Sied to guide you. I loved this tour, Dubai by night is amazing and a must see. My Guide Mounir was great fun very easy manner never rushed the evening very informative and took me to the absolute best places to see things. Burj Khalifa at night truly a site i will never forget, looking down at the fountains bought tears to my eyes. I will never forget this night.